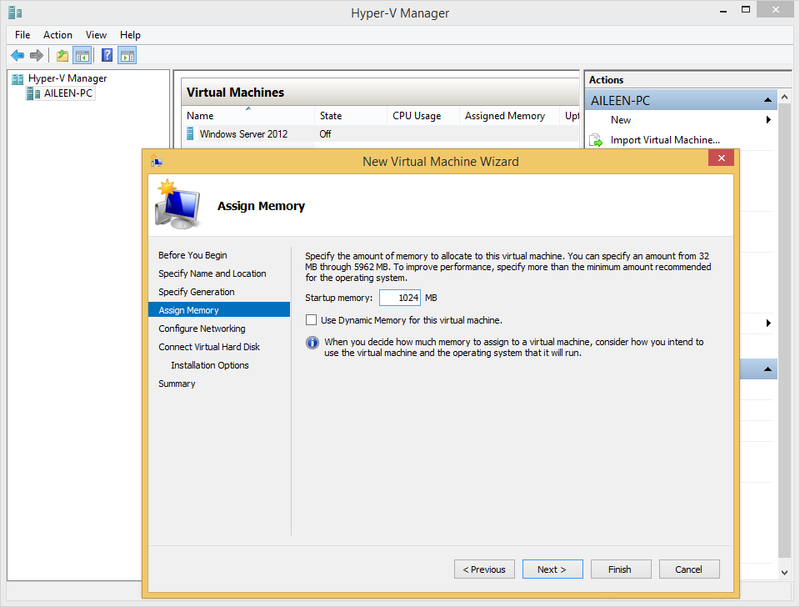 "KB2600640 is not installed on this computer." 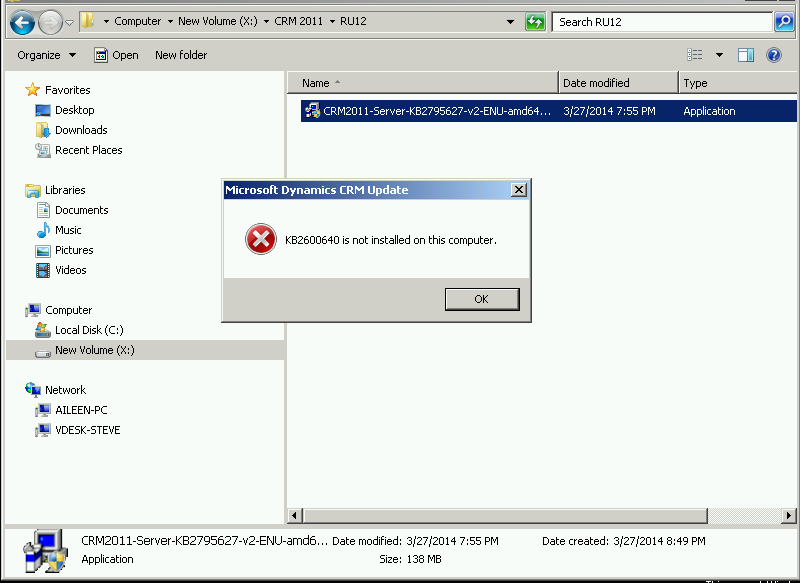 If you receive this error, you should install CRM 2011 Update Rollup 6 first before you can install Rollup 12. You will se that the version that you required before is same. This action requires Restart Server. 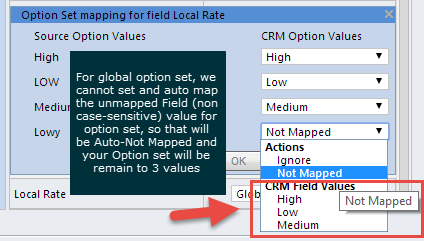 Hi, Option Set Value can be added through Your field customization and you just add the item value, like this and commonly, it will be done by CRM Administrator only since it is related to Field Structures. But, have you ever faced condition that your Option Set Value suddenly become added and added without anyone changes, you realized it when you see the data, the Option Set that it used to be only has three values : High, Medium, Low, but currently it has 4 values, that is + Lowy, and you checked to your System Admin or System Customizer are they have added some value, then they said they have not done any changes. So this is maybe the scenario that you could face, and I share to you because one of my customer ever reported that to me, and I was very confused at the very first. You are very sure that you have created that field and only 3 values. Then, your client/user does the Import Data as usual, it has been repeated several times without any one realizing any product, so still safe. Then, import using standard CRM improt wizard and suddenly, they call you and ask whether you have added some Option Set Value, because when they export back the data, they checked that they are 4 values, instead 3 values, the CRM Administrator also feel that he did not add any value. So, I was confused at the time, because after already handover, I have never been handling that anymore. Yes, then, I found that there is "Lowy" as new value added.. Yes, then I try to ask customer about the data import, then I try to re-import to learn about this case. Then, I learn that in one of the data record, they have "Lowy"
Another solution, please using the Import Template feature to prevent users key in another option set. Hi, here I just want to give summary of CRM 2013 Update Rollup, so every time want to see what has been fixed or what new or to download the Rollup, just refer to this blog. The chart (for any other entity) does not display in Korean due to System.ArgumentException: "Value of 'Malgun Gothic, Segoe UI, 9.5px' is not valid for 'units'." Script error occurs when moving from a form. "Unable to get property 'get_filterType' of undefined or null reference"
Creating a workflow to update an appointment with fields from the regarding Lead field fails. "An unexpected error occurred." Unable to set a web resource to visible in script if 'Visible by default' not set in designer. You´ve created a new business process flow and assigned that process flow to the security role of "sales manager", "system administrator" and "system customizer". You publish this modification and expect the process the be visible only for these security roles.Instead the BPF is hidden for all users.Instead the BPF is hidden for all users. For a custom duration field Xrm.Page.getAttribute("durationfield").getValue() method returns a formatted value like 30 minutes instead of 30 as expected. Consider you've created a Business Process for cases having a related task stage with several steps and you'd like to translate all stages to different language. Your solution contains task and case entity as well as Business Process. You're exporting translation files and try to edit those. You'll find all stage names from case entity, but you do not find those of the related task step. Therefore you cannot translate those. "Email a link" URL does not navigate to the specified entity if opened in existing browser tab. Not able to see "Page Index" on subgrids from dashboards. Mobile clients crash with UI Error: "We're sorry. Sorry, something went wrong while initializing the app. 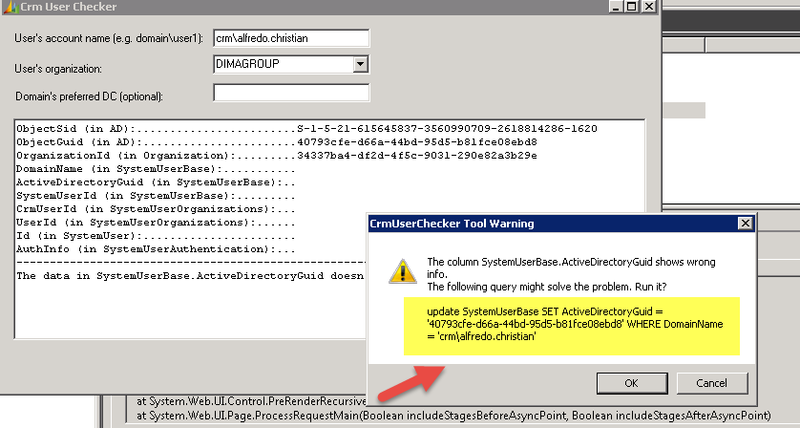 Please try again, or restart the app"
CRM 2013 Outlook filtering does not work after you perform a quick find search. When you use Internet Explorer 8, the related record dropdown is missing when a record is opened. 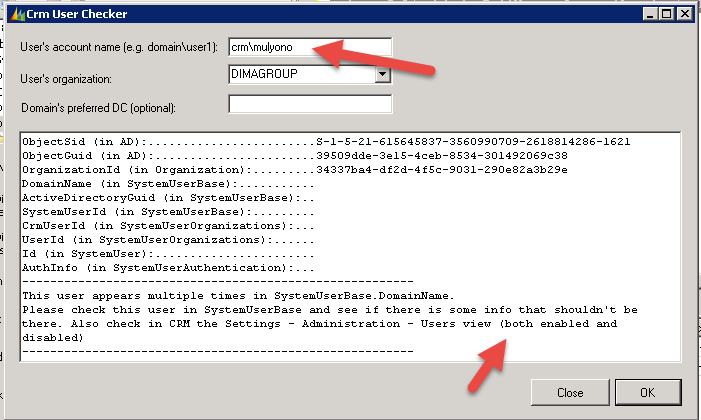 When you use the Upgrade Wizard, an error message is shown with a red flag in the System Checks window: "The product key is not compatible with the installed version of Microsoft Dynamics CRM"
Upgrade does not create relationship for custom activity entities to mailbox_sendermailboxid. 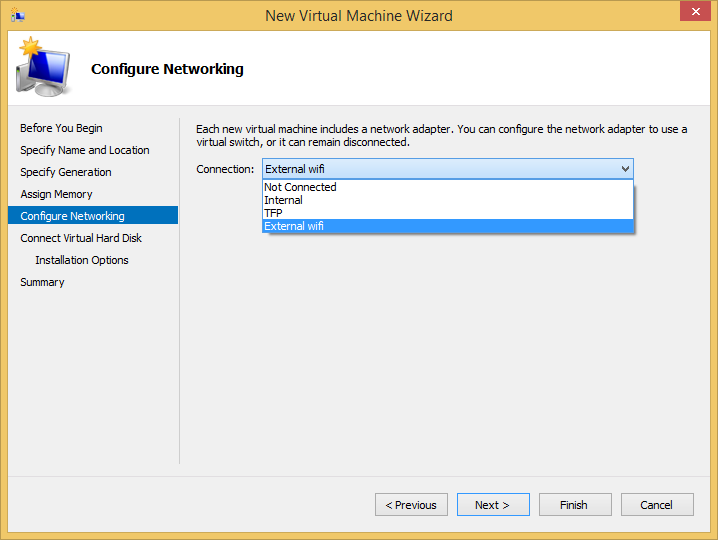 When you run the email router to process incoming email, some email may be skipped. This occurs if the email in Exchange Server has a different message class than the IPM.Note default. When you try to use a view that has a condition for Owner Equals Current User's Teams and the user does not belong to any team that has a security role, you receive an error: Invalid Argument. When you click the hyperlink in a lookup field after you focus in the field, you receive a script error. When you create a recurring appointment that has exactly 16 occurrences, only 15 occurrences are created. When you create 17 occurrences or more (or 15 occurrences or less), the correct number of appointments are created. 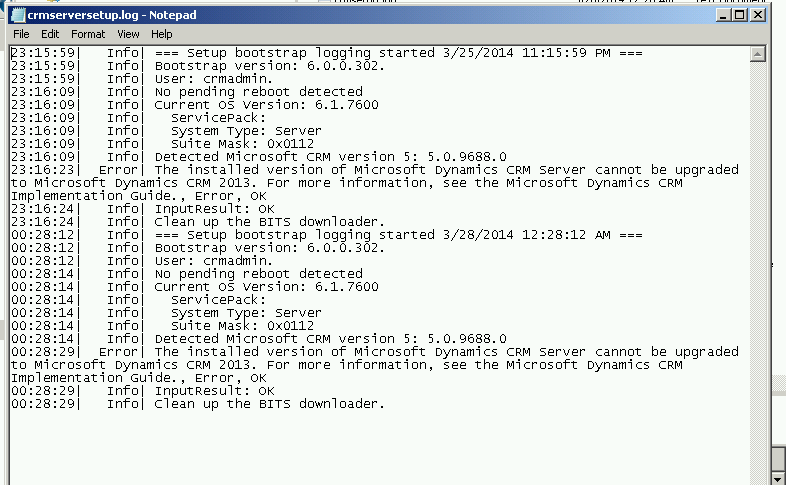 Microsoft Dynamics CRM 2013 has inconsistent behavior, depending on the place from which the case is resolved. When you click Resolve Case from the entity Form, the Resolution (subject) that is passed in by the end-user is replaced by the generic phrase "Resolve Case." 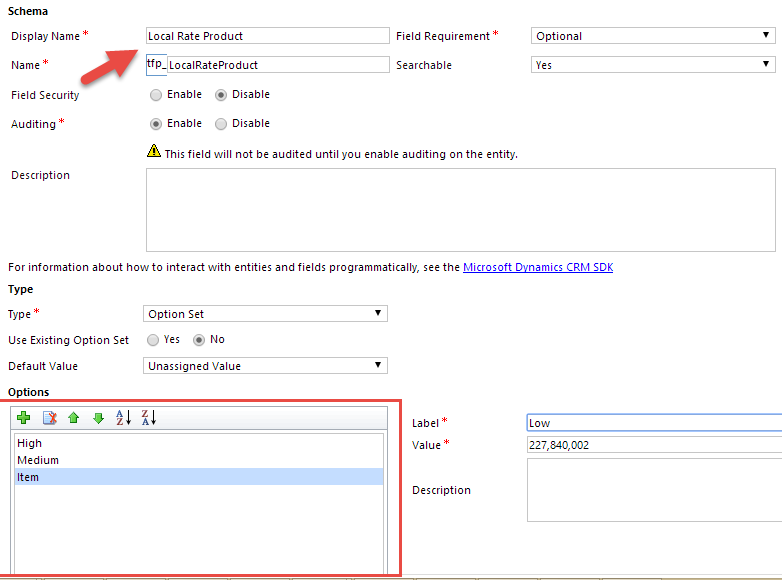 When you click Resolve Case from the Grid, Microsoft Dynamics CRM saves the value that was provided by the end-user. 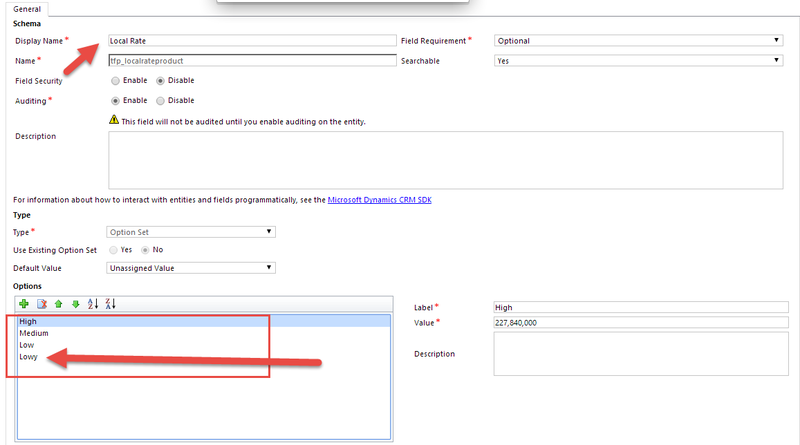 In Microsoft Dynamics CRM 2011, the value was provided by the end-user and not overridden by CRM. 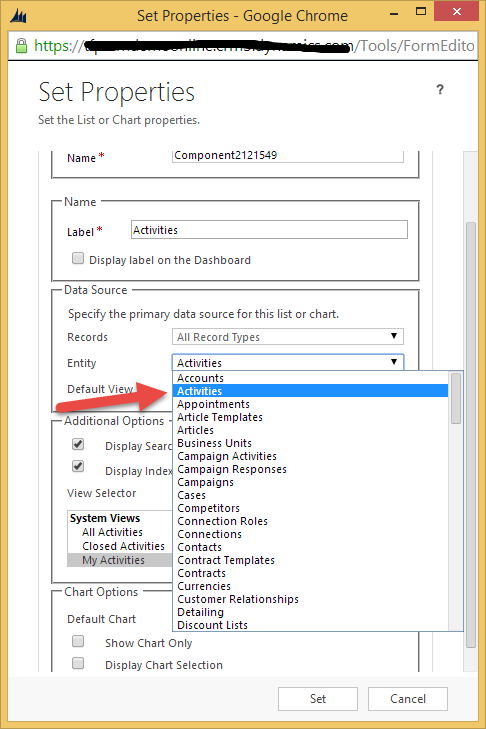 When you view completed activities, such as email, you cannot select any text on the record. This includes the body control. 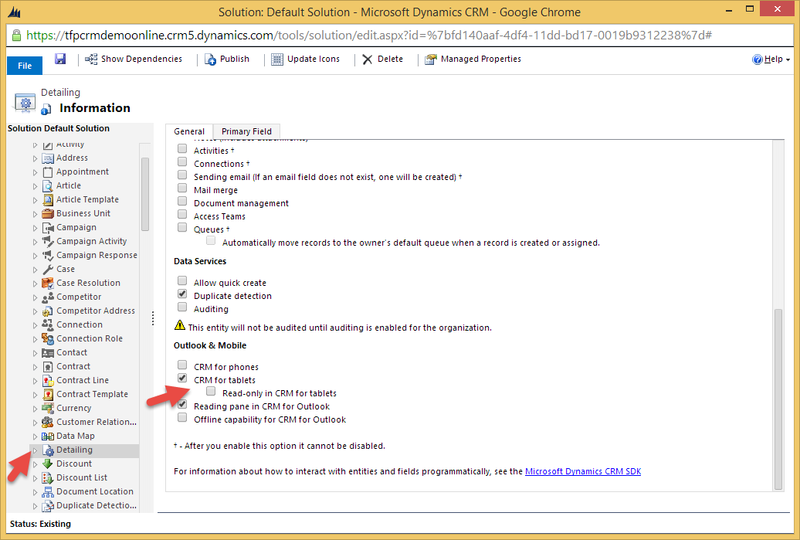 Users of the offline edition of the Microsoft Dynamics CRM Client for Outlook cannot configure their Offline Scheduled Sync settings under Personal Settings. 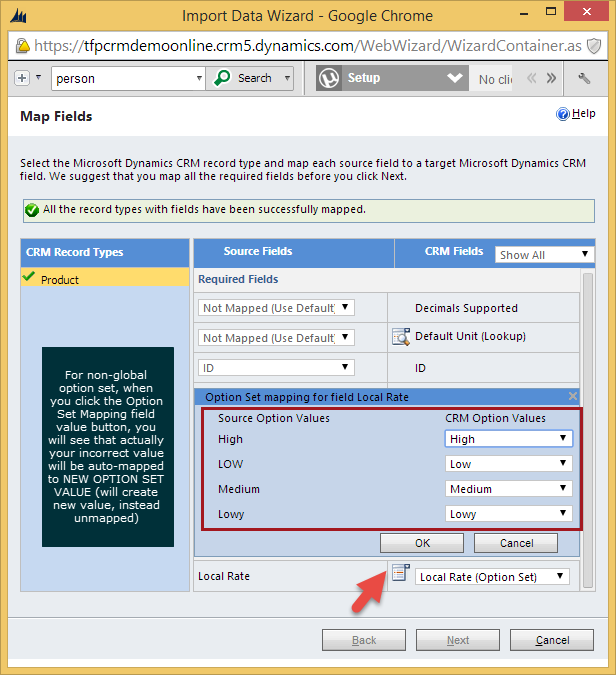 Depending on the placement of an option set field in a section of the Microsoft Dynamics CRM 2013 form, the number of visible options is limited, and the user has to scroll to see the remaining options. 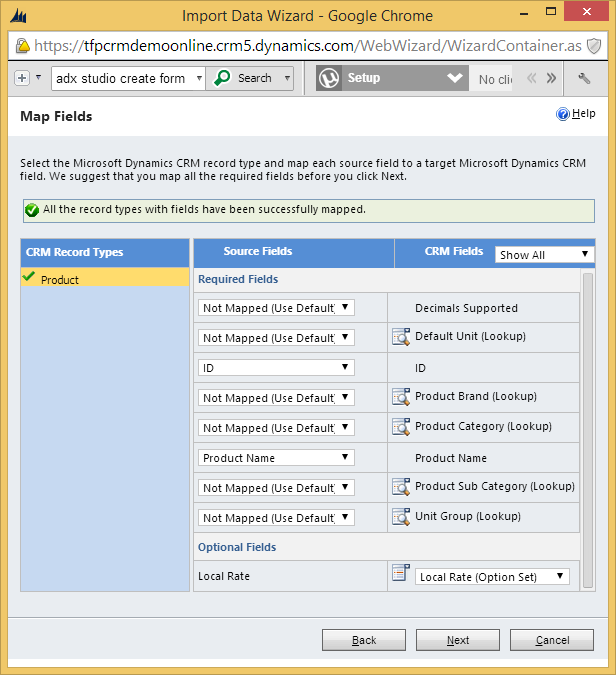 Field alignment setting is not respected on Microsoft Dynamics CRM 2013 forms. 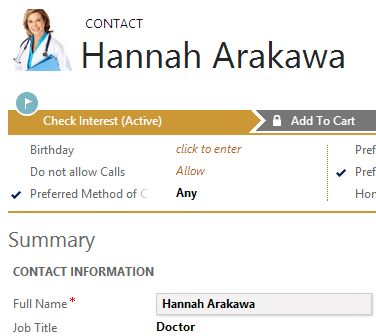 You cannot customize YomiName fields because the detail form does not display. Copying and pasting multiple lines of text from a Microsoft Word document to the body of a Microsoft Dynamics CRM email activity record causes additional line breaks to be inserted between each line. 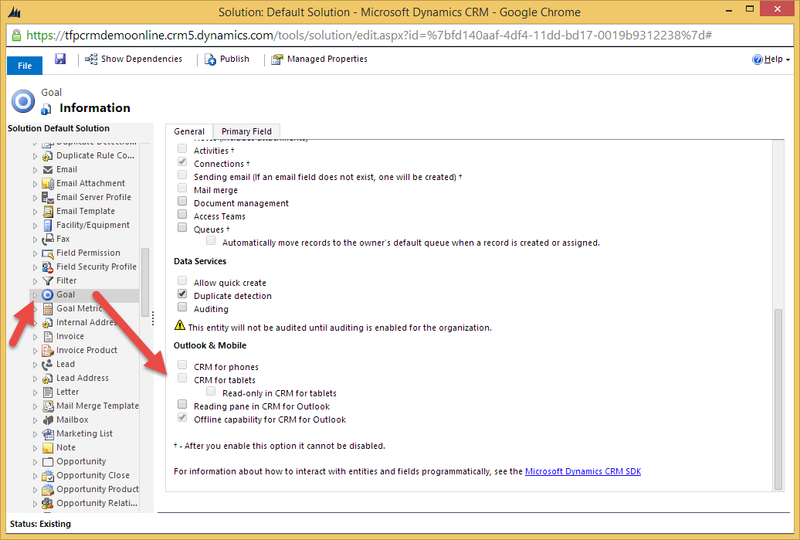 When you use Chrome to view duplicate detection rules in Microsoft Dynamics CRM 2013, the criteria are not shown every time that you open the record. You may have to close and then reopen the record an undetermined number of times before the criteria are shown. Outlook client is unresponsive during startup. 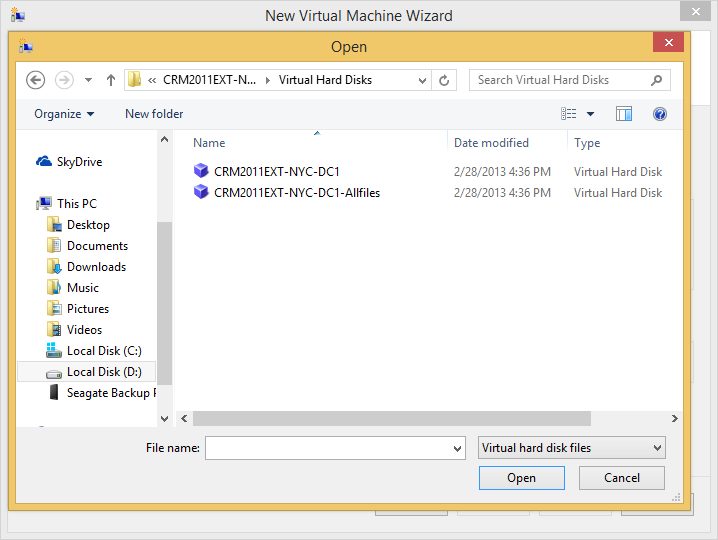 When you save or send an email from the Microsoft Dynamics CRM 2013 web client in an email activity that had a template inserted, the body is saved or sent with nothing in it. If you edit the email body after you insert the email template, or if you use the insert template button on the email editor toolbar, the body is saved or sent correctly. 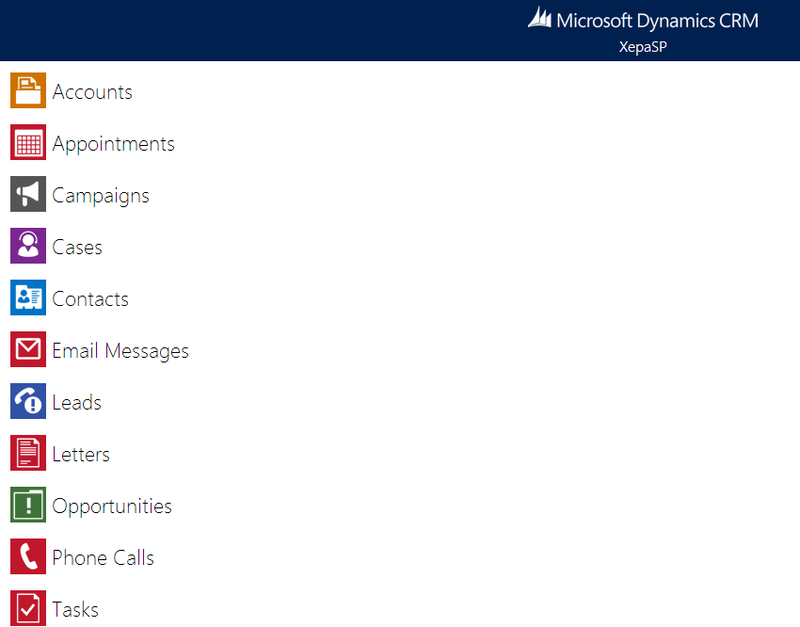 After you upgrade or install Microsoft Dynamics CRM 2013 when you create a telephone call activity from an existing contact or lead, the telephone number field is not populated correctly. 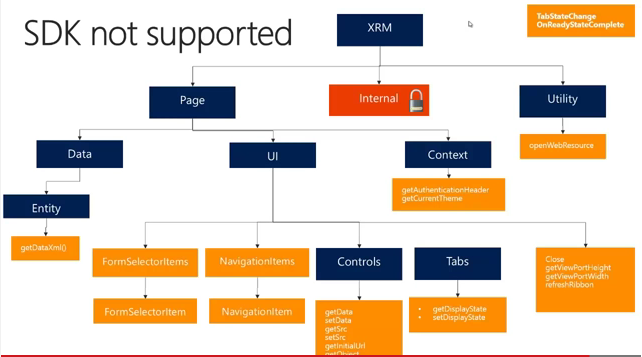 This behavior is different from what occurred in Microsoft Dynamics CRM 2011. Outlook saved views are not sorted alphabetically as they are in the web client. Outlook saved views should be sorted exactly as they are in the web client. Deadlocks occur when an Associate request is called to add users to teams. Lots of notes cause the focus to be lost when you create new notes. Custom reports that aggregate with a groupby on OptionSet fields display: #Error. Field security on check boxes causes JScript error when you save. When you have a web resource that should be shown across the width of a section, and you change the visibility of the web resource, the width is reduced by half. Incorrect "Do Not Allow" notification is generated on Phone Call/Email. Subgrids update continuously with a "Loading..." message. Consider the scenario in which using Microsoft Dynamics CRM 2013 affects synchronous plug-ins or synchronous workflows to perform an update of the StateCode and StatusCode of Activity entity. The StateCode and StatusCode action is taken Post-Create synchronously then an exception occurs on the Save. When the same plugin code registered asynchronously, it will process and complete without error. 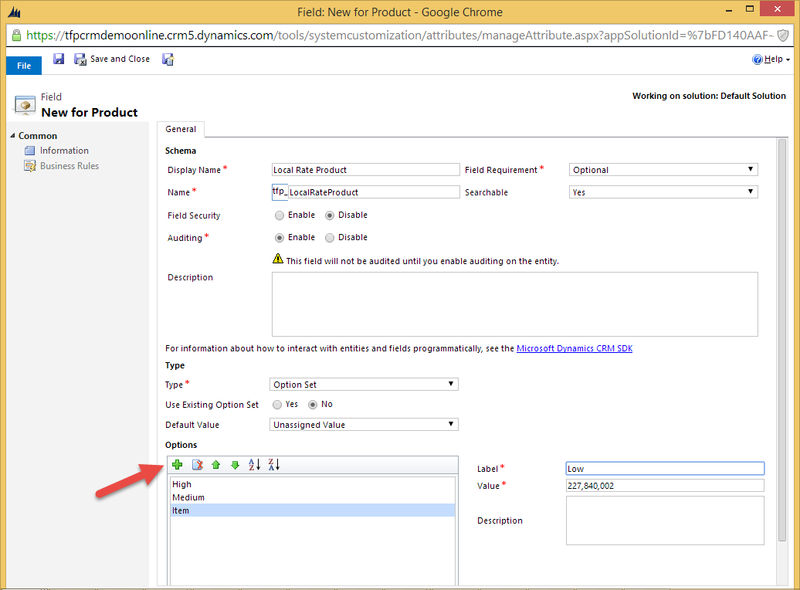 Query Builder error occurs when you use addCustomView that contains a related attribute. When you set IME mode on an attribute on an entity to ACTIVE, the IME mode is not honored. This occurs with Single Line of Text, Multiple Lines of Text, and other attributes that are bound to input elements or text area elements. After you paste a numbered list into the email body control and convert the pasted content to a bulleted list, the bullets are misplaced above the selected text. The bullets will appear on their own separate line, even though there is no line break. Additionally, the text cannot be moved up to the bullet so that both the text and the bullet appear on the same line. Personal View is removed when Show Selected Views is used on Dashboard Grid after redraw. 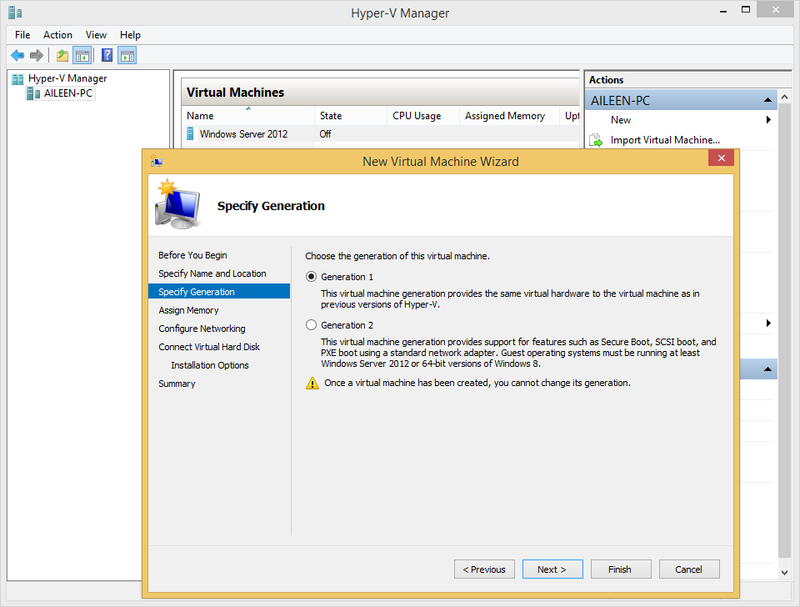 Time Format selection is not reflect correctly in setting. Unexpected format changes occur when you create mail messages from an email template. 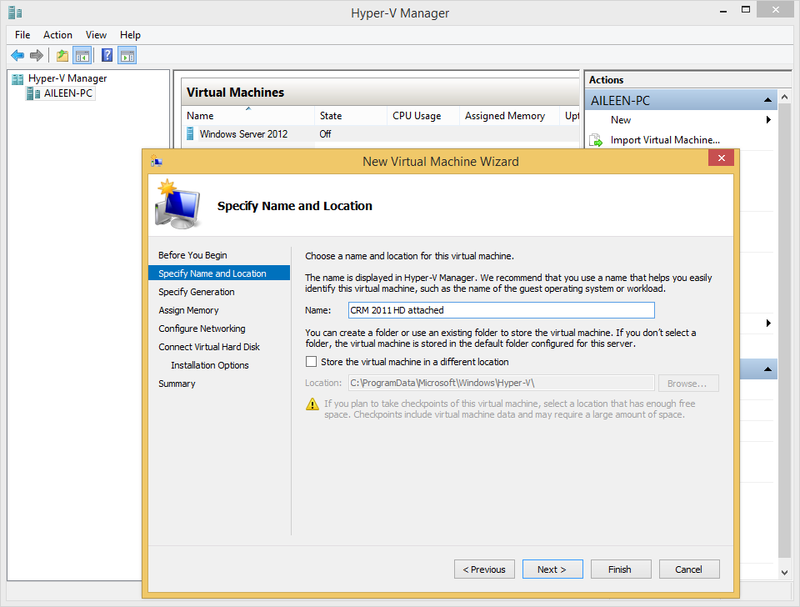 Users who have no Create permissions but has Read, Write, Append, and Append To permissions cannot select an Entity record that has an N:N relationship. This occurs for both custom-to-custom and system-to-custom entities. 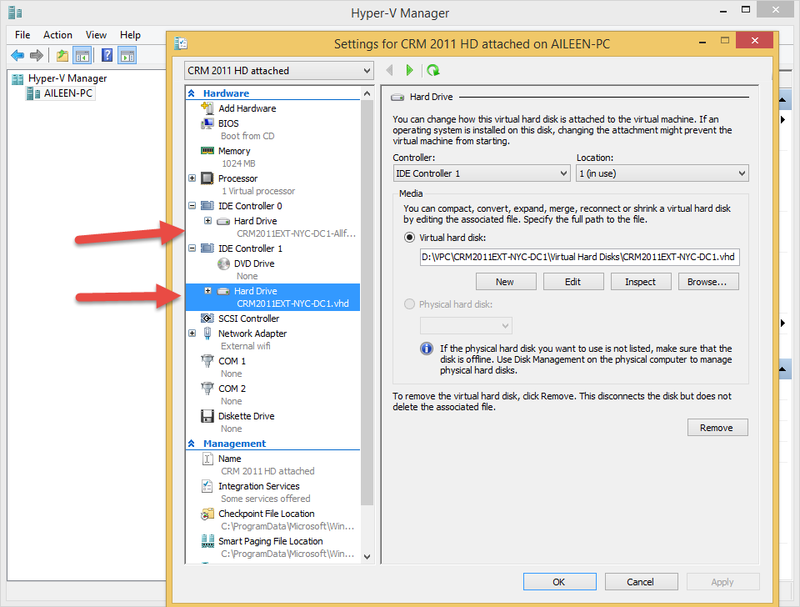 When you import an updated solution that contains lots of entities, the import is not completed in Microsoft Dynamics CRM 2013. If a user presses the Enter key in the body and then presses the Delete key when the user is replying to email activity records in the application, a line break is inserted into the body of the form. When you review Microsoft Dynamics CRM client for Outlook tracing, the tracing incorrectly suggests that an item was being updated when in fact it was being created in Outlook from a synchronized CRM Microsoft Dynamics CRM item such as a contact, appointment, or service activity. Disabling Auto-Save does not disable Auto-Save when trying to navigate away from a form before saving. 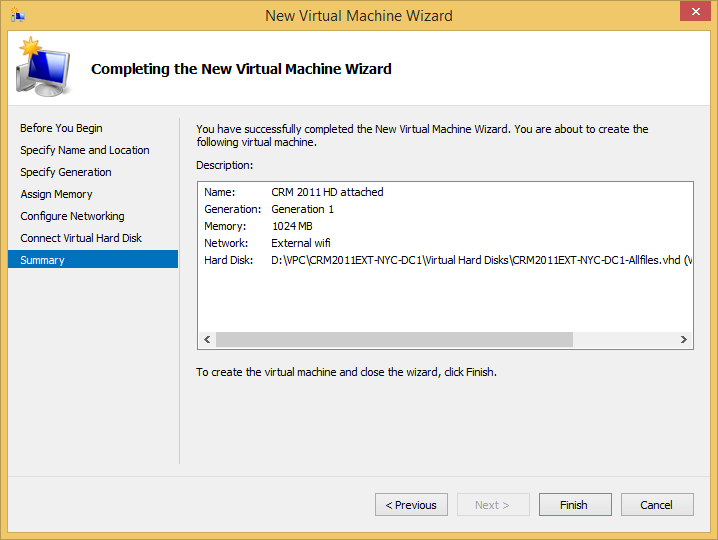 In your experience in CRM 2011, Have any problem with Create New User or login with user, but still said invalid, etc? 1. The user was coming from upgraded CRM version and you were not mapping when you should map that. Then see whether return two or one entry. 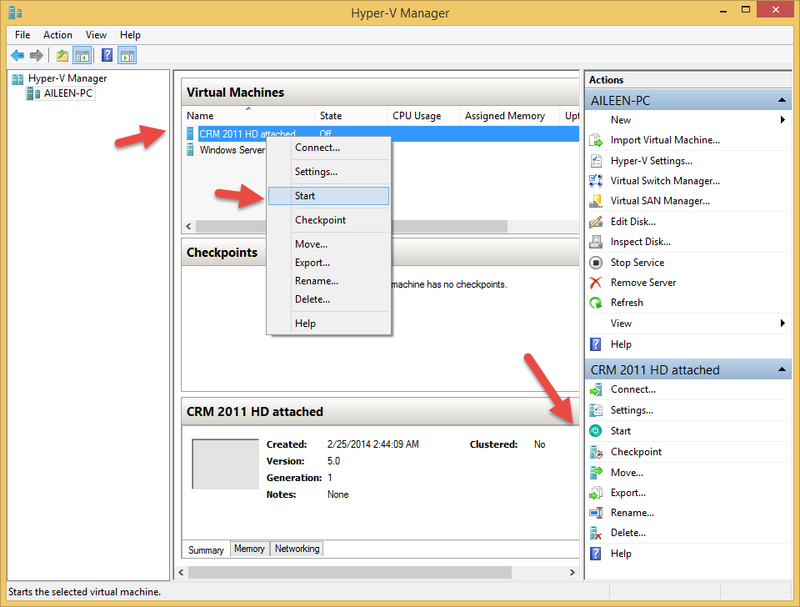 You also can use CrmUserChecker Tool which is you can get from Microsoft when you contact for their support. And very informative, which is showing you that You have two entries of the same Domain Name in the SystemUser view. 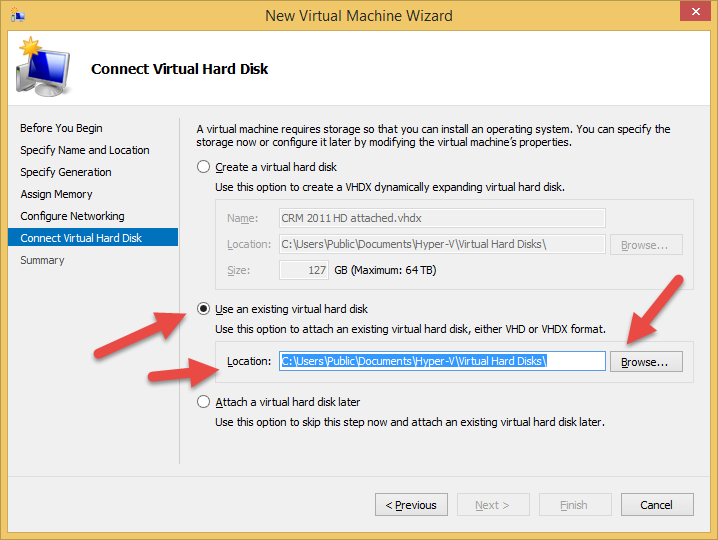 It also can be problem solver when you execute this tool by clicking OK two times after pop up out to choose OK or Cancel. It also gives you every detail of the Query to make you more understand and also gives you Diagnostic about the inputted user. 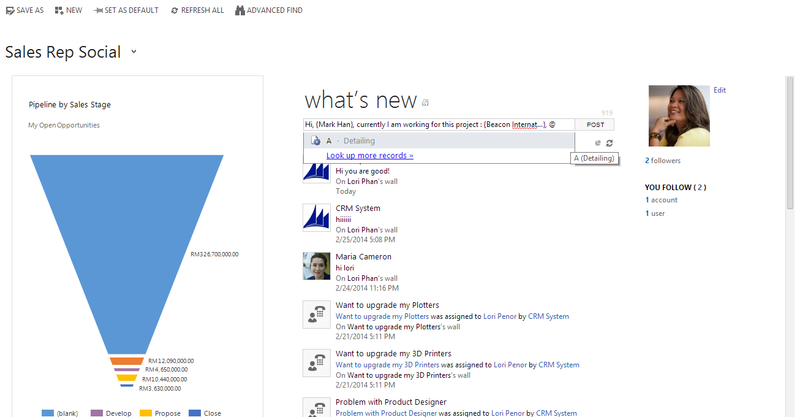 Within the release of CRM 2013, some of the features are great UX and UI at the iPad or Windows 8 or Surfaces. I was impressed this is very good UI. 1. This feature only available for iPad and also Microsoft Surfaces or Windows 8 Apps, so for Android or iPhone or Blackberry, currently you might be access the CRM for Mobile Express, but cannot get this wonderful UI. Well, but you can rename it, maximum columns still same, that is 6. Here, you should modify this Sales Dashboard system Dashboard. 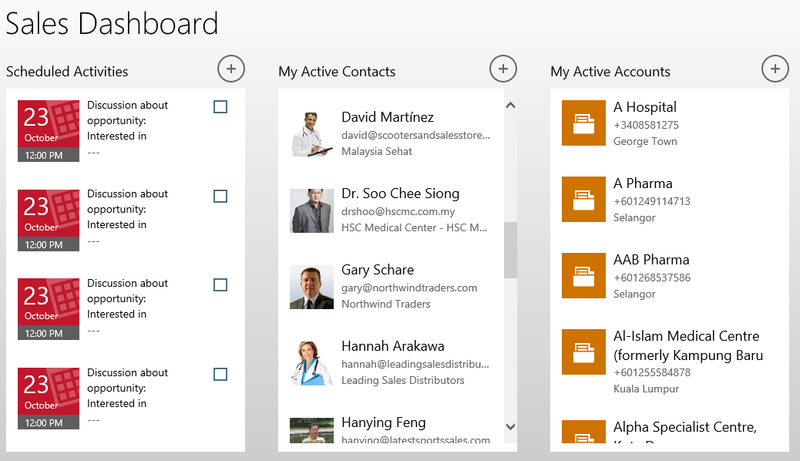 Then, you can still do same customization like you do in the Dashboard Customization for System Dashboard. But, please back to the rule #3 dan rule #4, if you include any Web Resources or iFrame, those will not be displayed to your Sales Dashboard on Tablet. 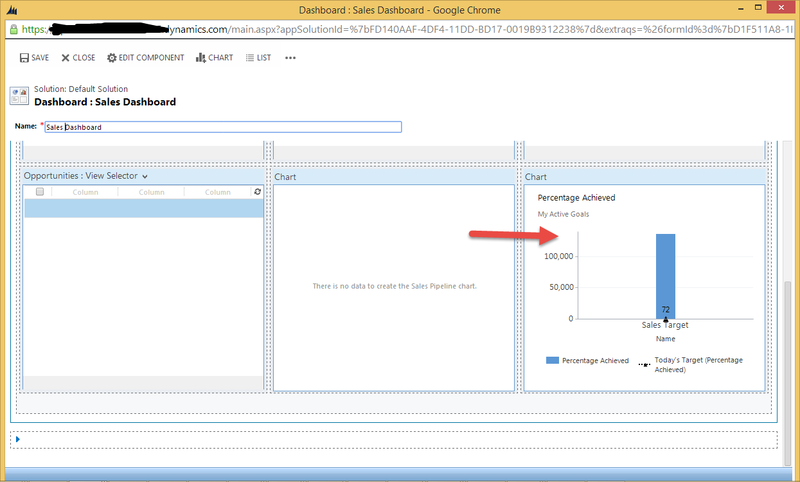 Only list and chart with limited 6 components that will be available in this Sales Dasboard and all user will see the same Dashboard Component, the data will be displayed based on the security role. And back to rule #3 for example, if I put the sixth column as Goal Chart, I can access from here (from preview at the customization stage and also from Web), but this Goal Chart will not be displayed to your Tablet Dashboard pertaining its status : cannot be enabled for CRM for Tablet. 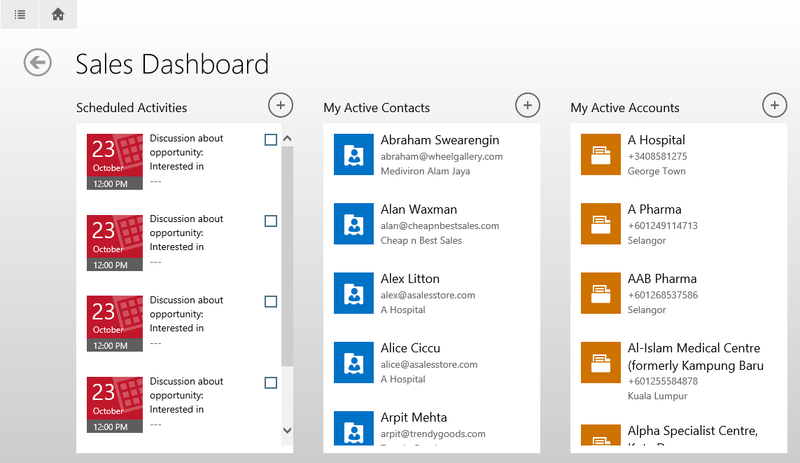 Like mine, it will be only show 5 columns of Dashboard since the sixth column is dedicated for Goal Chart. iFrames - typically used for including web pages in a form. 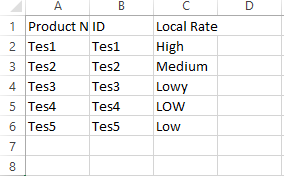 The ability to switch to another form when there are multiple record types per form. 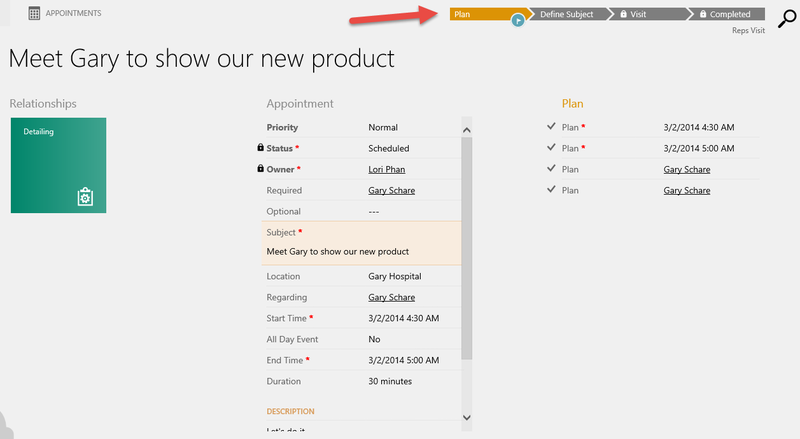 The CRM for tablets app always uses the first form in the form order that you have privileges to use. You can also have Business Process Flow in the CRM for Tablet and also can switch process. 8. 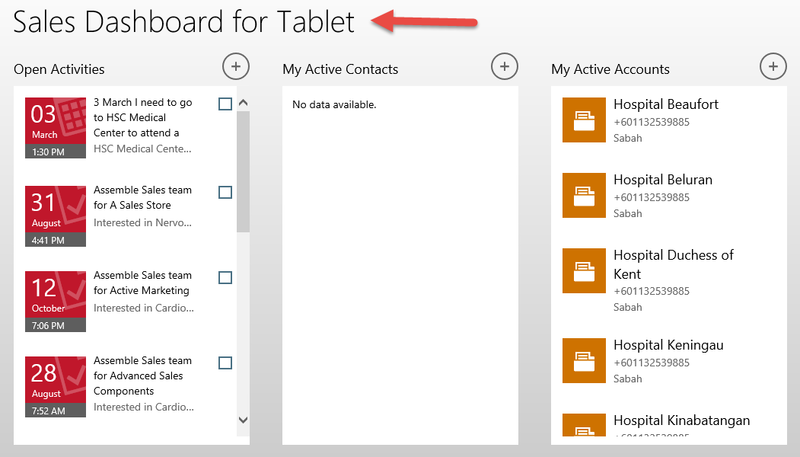 Then, make sure that the user has security role privilege to access CRM for Tablet. "Make sure that the Use CRM for Tablets permission is checked on in your security role"
then the user should download the metadata changes. 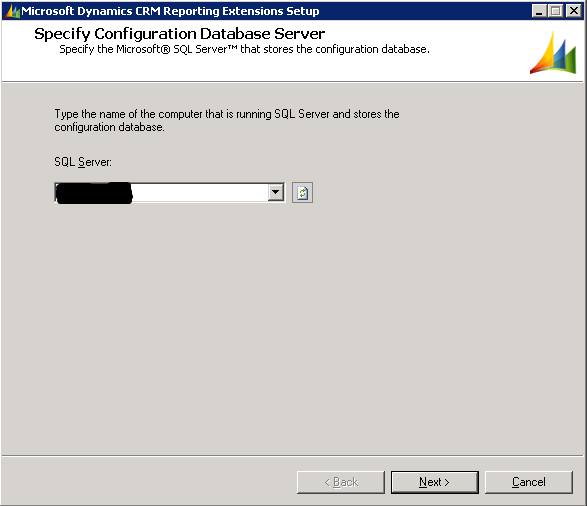 "Metada checked each time app is opened or when app is inactive in background and reactivated (if last check was over 24 hours)"
Ever face when you install CRM 2011/2013, database and application are connected but when you try to install Reporting Extension, you don't find any SSRS Instance. 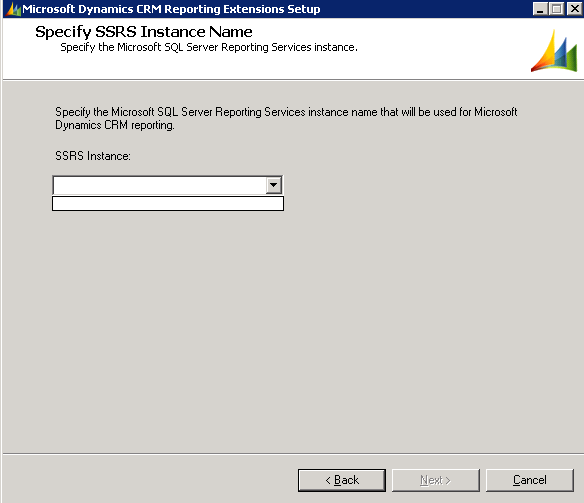 You should install your CRM Reporting Extension in the same server where your Reporting Server located at. Here I share some tips and tricks what I have done to demo to Health Care or Pharmaceutical Companies. Convince them that choose wrong CRM can be bad commitment from them since it will only add paperwork for their Sales Reps that loving freedom and mobility. Say to them we are User friendly because we are Microsoft and UX is similar with other Microsoft Product that we have got used to. 1. Prepare your data, make sure that you have many Hospital Data or Pharmacy, or Clinic Data. Convince them that you were preparing very well only for them. 2. Because the company will have to maintain customer, also with doctor, convince them that CRM can be tool for Key Opinion Leader Management, show them about 360 degree of your customer, show them the contact card to know detail about the Doctor or Key Opinion Leader. Give them visualization (Doctor Photo, for example, say to them if I am new sales reps, I have to visit whom? I can see the picture). Don't forget to modify your Sales Dashboard also. 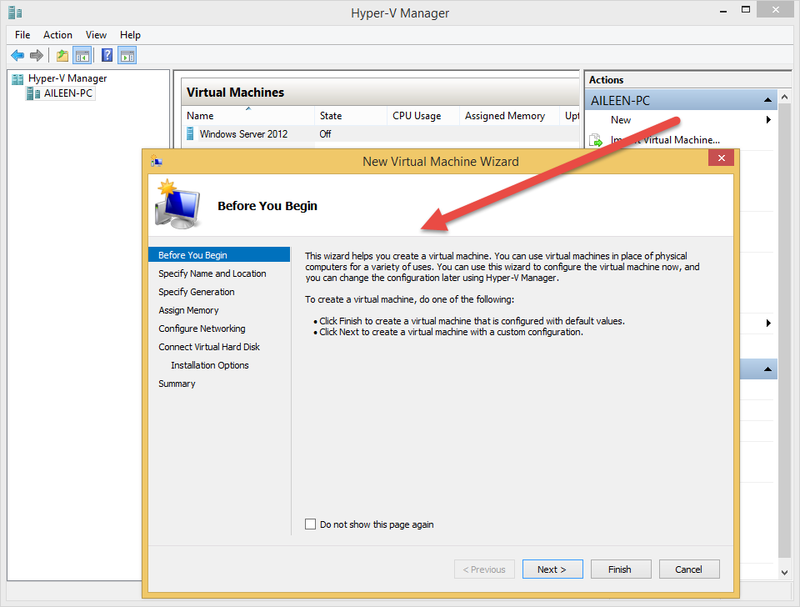 If you have existing Hyper-V Virtual HD and you don't have any other configuration file to be imported to your Hyper-V, but you still want to use that Virtual HD, here are the steps to you to attach your existing VHD. 9. Then OK, then go to Summary, then Finish. 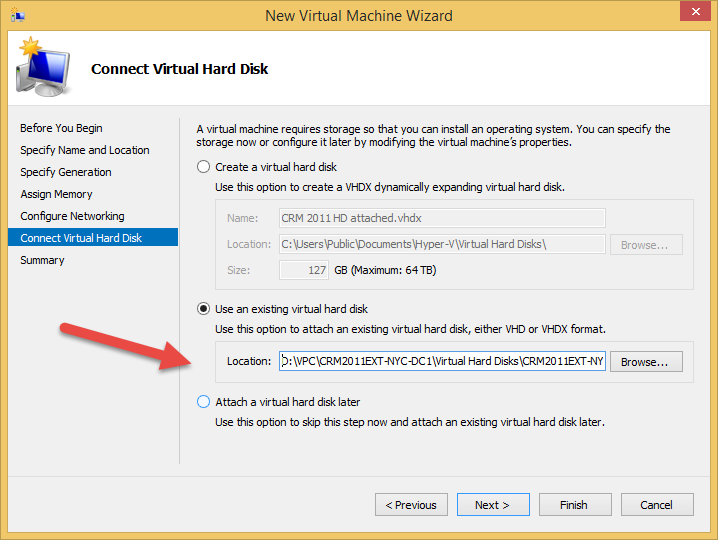 (if you have two vhd before and you cannot use because it is not bootable, so first you have to create new virtual machine, then attached the new one).